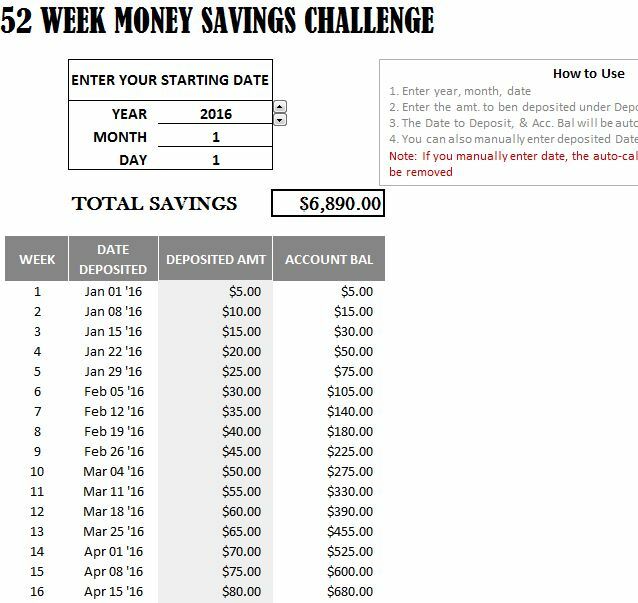 Take the challenge this year by downloading the free 52 Week Money Savings Challenge. This free template is exactly what you need to shake up your routine. The free template makes saving easier. You have the power to create goals and if you meet the challenges placed within this fun and exciting template, then you’ll find a much fatter wallet waiting for you at the end. When you download the free template, you’ll notice a simple structure that allows you to enter a savings goal and a weekly schedule you can use to make sure your goals are being met. To get started today, just follow the link at the bottom of this page. You can download the free template by clicking the link at the bottom of this page. When you have the document, just open the file to start entering your information and start the challenge. Start by entering the date in the first section of the template. You will enter the year, month, and day that you want to start your money savings challenge. Next, start small and enter your savings goal in the space indicated. The template will take all this information and show you how much you need to save and leave in your account every week. You can see the date you deposited the money, the amount, and your account balance. You can see from the example that every week, the amount you save will continue to increase, along with your account balance. You can see how easy it is to save more than 6,000 dollars over a 52 week period. You have the tools, time, and money to start saving, now you just need the right mindset to make your goals a reality.